14 January 2019 (Toronto, ON) - Multi-platinum American rockers BREAKING BENJAMIN have announced their return to Canada to follow up a North American headline arena tour this spring, starting on April 12th in Abbotsford, BC. The tour will include support from Asking Alexandria and British Columbia’s own, The Wild. Tickets go on sale to the general public beginning Friday, January 18th @ 10 AM local time. Ticketed VIP packages and pre-sale tickets will be available as soon as 12pm EST today. For more information on tickets and VIP packages, visit www.breakingbenjamin.com/tour. 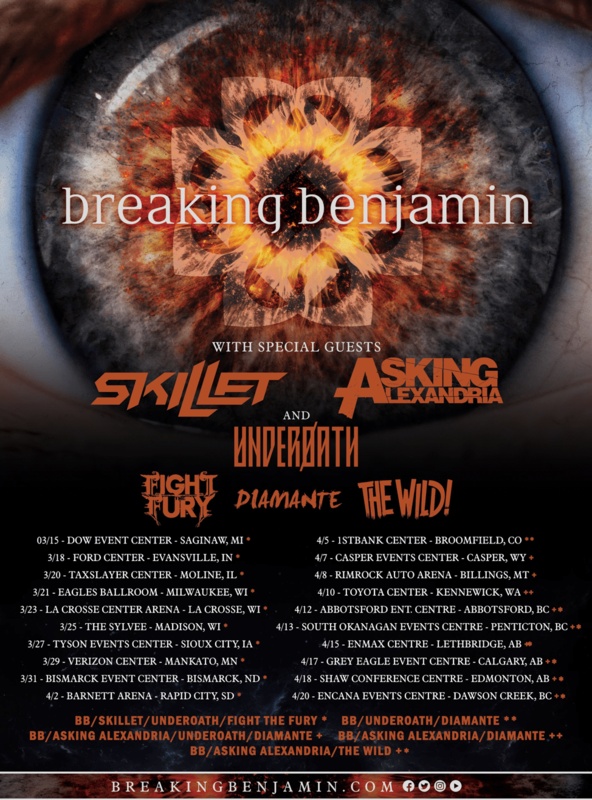 This will be the first run of dates for Breaking Benjamin to headline in Canada since the band’s April 2018’s release of EMBER. The band’s 6th album debuted at #3 on Billboard’s Top 200 chart and has since spun off two #1 rock radio hits with singles, “Red Cold River” and “Torn In Two”, making the band’s eighth and ninth #1 singles to date. 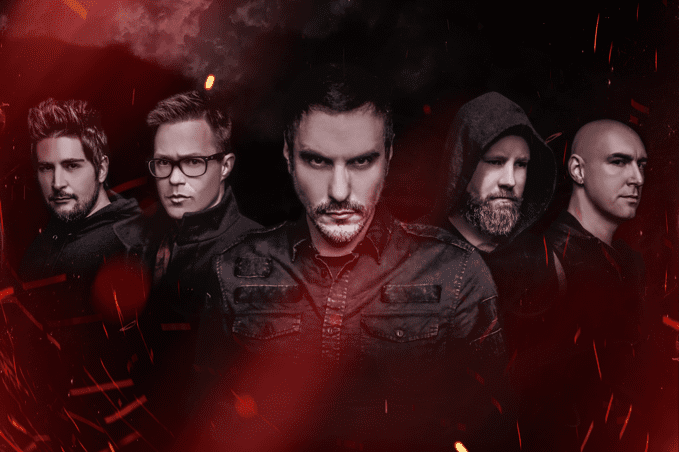 The end of 2018 saw Breaking Benjamin wrapping up a co-headline arena tour with Five Finger Death Punch, and releasing the third part of a video trilogy for their latest single, “Tourniquet”. Watch the official video HERE. Breaking Benjamin’s self-produced sixth studio album, EMBER debuted at #3 on the Billboard Top 200 in late April. EMBER is the multiplatinum band’s fourth Top 5 debut on the Billboard Top 200, following 2015’s #1 debut for Dark Before Dawn (Gold), 2009’s Dear Agony (Platinum) which debuted #4 and 2006’s Phobia (Platinum) which debuted #2. EMBER has already spun off two #1 hits at Active Rock Radio granting the band their eighth and ninth #1 singles to date. EMBER adds to a healthy 7MM+ album units sold for Breaking Benjamin and charted in the Top 10 across numerous countries Worldwide, as well as broke records by topping #1 charts across various genres, such as: Top Alternative Albums, Top Rock Albums, Top Hard Rock Albums and Top Digital Albums. Breaking Benjamin boasts an impressive 4.5+ Billion streams worldwide, a testament to the band’s global influence and loyal fan base. Purchase Ember or stream the new album here. For more information: https://breakingbenjamin.com, https://www.facebook.com/BreakingBenjamin and https://twitter.com/breakingbenj. Asking Alexandria have earned a place among the most streamed, downloaded, watched, and altogether listened to bands in a generation, combining the innovation of modern active rock with the traditional attitude of the culture’s trailblazers. Asking Anthems “The Final Episode” and “Not the American Average” were both certified gold by the RIAA for single sales in excess of 500,000 each. The music videos for those two singles alone amassed over 100 million views on YouTube. “The Death of Me,” “Moving On,” and “A Prophecy” together account for over 100 million more. The videos from The Black were viewed 70 million times. Made with producer Matt Good, Asking Alexandria’s self-titled fifth album is an unbridled celebration of acceptance, of the strength of diversity and the freedom of “leaning into the crazy” (as Worsnop puts it), instead of struggling for conformity.